A few years back, I told one of our single neighbors, "I cook like I'm feeding an army, so come on over for dinner". And this wonderful caring neighbor has been over for dinner several night a week. I really don't mind, cause he's a great sounding board and ginnea pig for some of my creations. Its great to have another opinion, where as from my partner all I get is a "it's good", or a shake of the head, or in a rare occasion a request to "make that thing again". With our neighbor, the only thing I have found he doesn't like is any product made with goat milk. With my new career as a cheesemonger, I've tried sneaking it in where I can, but he always detects it. So when he asked what was for dinner tonight, I thought, "do I tell him, or just serve it and see what happens." So as usual, I didn't tell him. Well, turns out that the pasta dish was so wonderful that he didn't even notice. Besides the fact that this is truly a great and easy dish, you'll want to make again and again. In a large pot, boil pasta according to package directions. Drain cooked pasta in a strainer, and return pot to stove. Over medium, drizzle olive oil into pot, then add garlic. 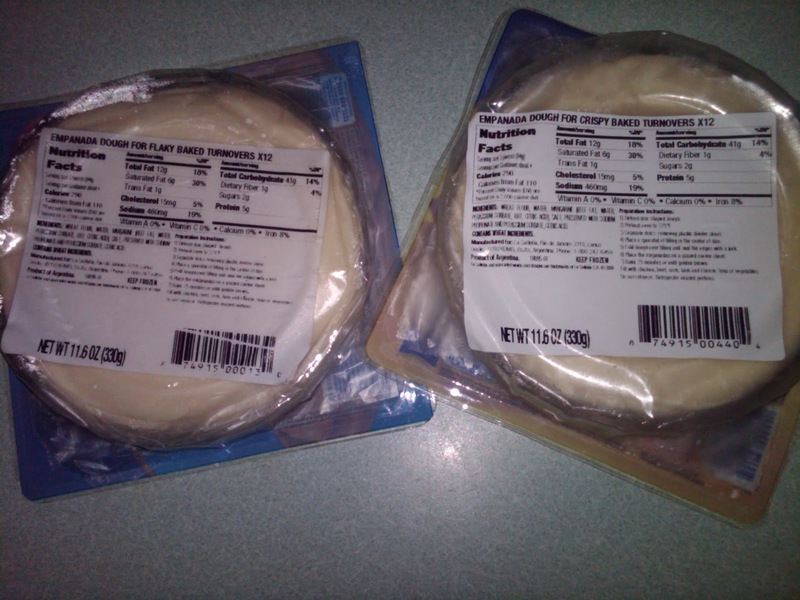 Cook for 30-60 seconds then add goat cheese and milk. 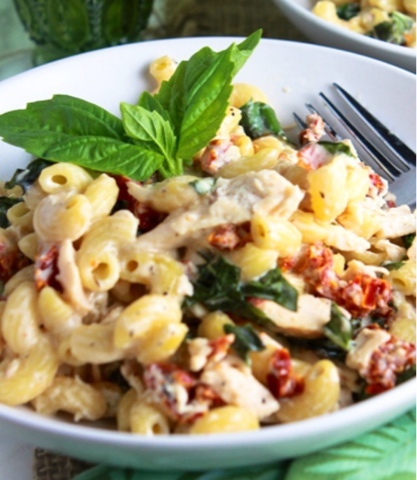 Remove from heat, add pasta, sundried tomatoes, chicken, and basil. Toss to mix. Salt and pepper to taste. I love these little treats so much, I decided to make them again, and repost this post below. Enjoy! This past weekend we went to a wine tasting party where the hosts open about 20 bottles of Malbec. When I received the invite, it stated, we’ll provide the wine, you bring your favorite appetizer. 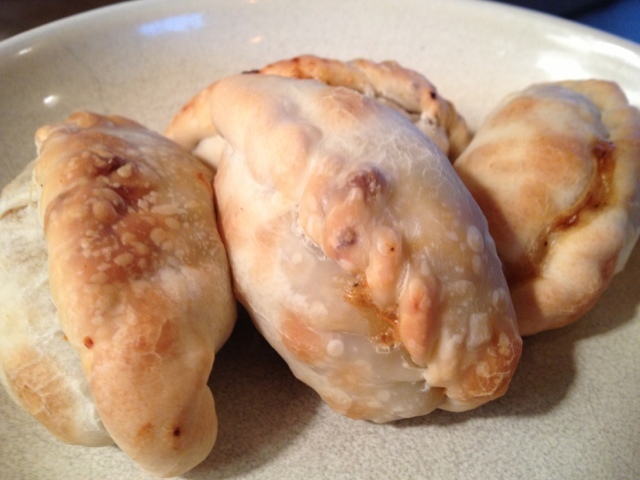 What better to go with Malbec, than Empanadas. Below are a few types I have made. In addition to these recipes I have included some information about how to wrap them and some of the more traditional closures. 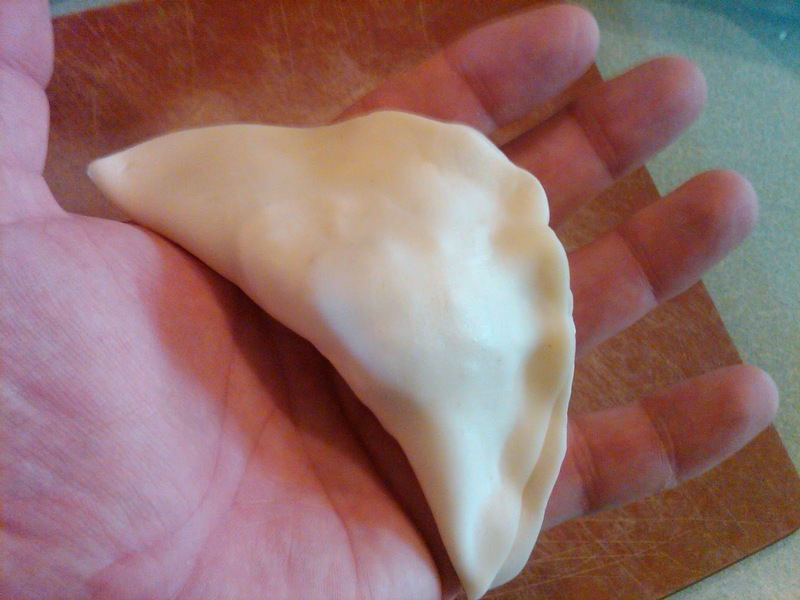 There is no wrong way to make an Empanada. 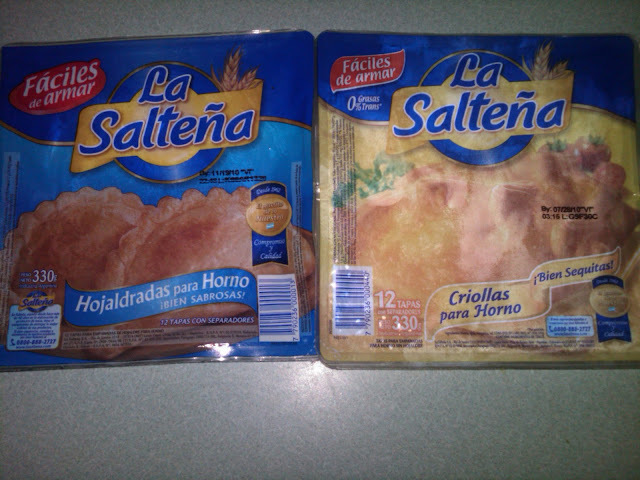 In many South American countries these are street food, and vary from vendor to vendor. You can add ANYTHING you want to the filling. In the past we have had a corn mixture, cheese, as well as Apple and Bananas. As for the closures, once they are folded you have no idea what’s inside, so the closure/fold is the key to knowing what is inside. Brown ground meat in olive oil. Mix in cumin, salt and pepper. While this is cooking, dice up the hard boiled eggs and olives. When meat mixture is browned (DO NOT LET DRY OUT!! ), mix in eggs, olives and tomatoes(with juice). While this is warming up, mix about ½ cup chicken broth with about 2 T cornstarch (I don’t measure), mix cornstarch mixture into meat mixture, allow to thicken. Cool and refrigerate overnight. Boil Chicken breasts in seasoned water. When finished, drain and shred cooked chicken. Place in mixing bowl. Mix together with diced potatoes, seasonings, cheese and dressing. Make sure it’s not too wet, or dry. As too wet will leak out of Empanada, and too dry will crumble when you eat. Refrigerate overnight. Brown Chorizo. When completely cooked, add in corn, red potato, green bell pepper, and onion. Mix thoroughly. Allow to cool and refrigerate overnight. 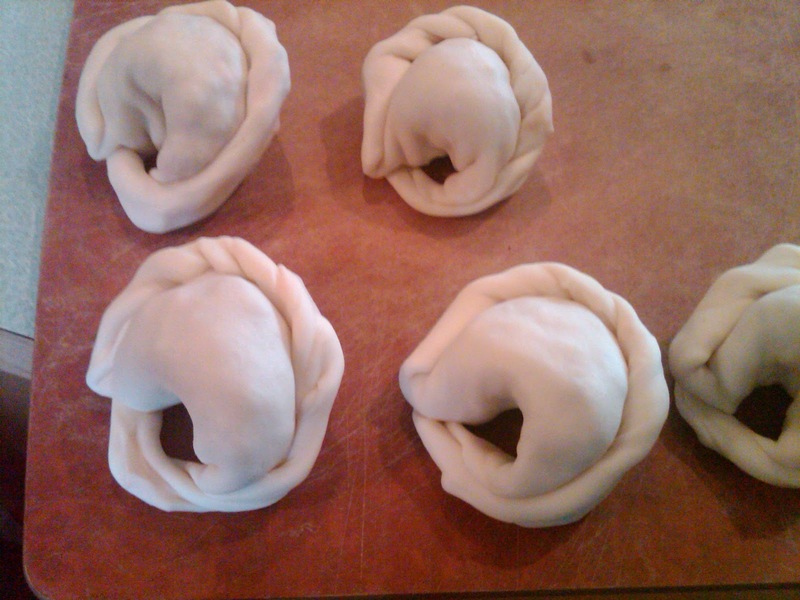 Now for the Wrappers…..you can always make your own, but why, when these are so incredible. I prefer the wapper on the right, as it is for a crispy baked. The one on the left is for flaky (like puff pastry). Both are for the oven, but there is a third that is for frying. 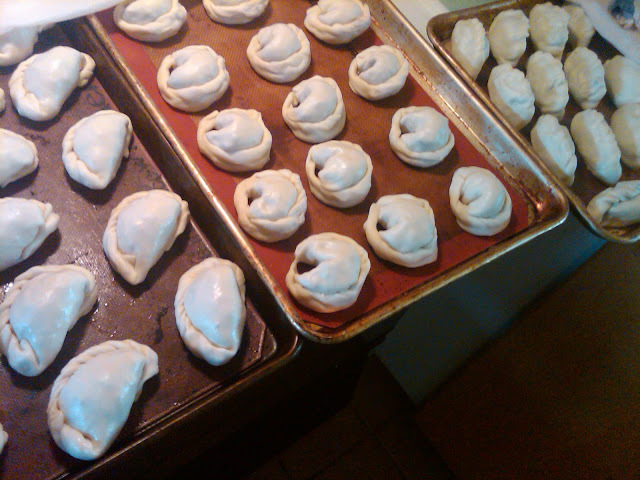 So as for the filling and folding…. Step one, use a scoop to measure out the amount in the center of the wrapper. 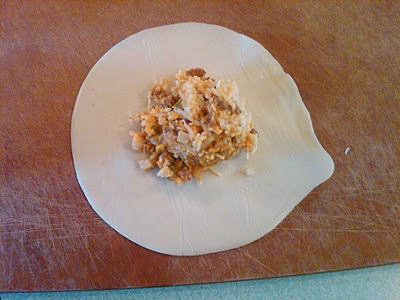 Step two, fold the wrapper in half and press to seal. Step three, start fold/rolling from the left edge, creating a unique seam. Keep the seams the same throughout the same filling process. If this intimidates you, use this hint, fold them the same way, place them on their side or standing straight up. Step three and a half, When I’m done folding I usually end up with a little tail. 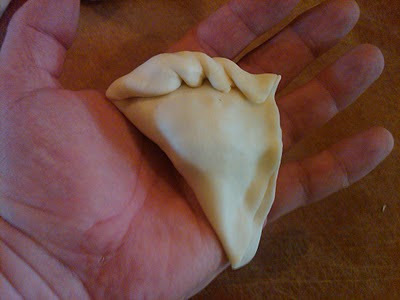 That’s an easy fix, fold the tail under and place the empanada on it. 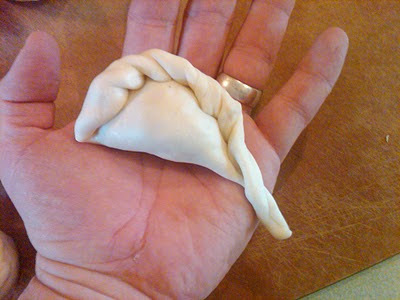 In this option I use a Tortellini type closure. Here are some examples of the different folds/closures I use. Picture from the most recent creation! I usually get up early in the morning…what do you do at 3am, you ask? Well, I make a pot of coffee, and turn on the cooking channel (or Food Network), turn down the volume and get on my computer to search the cooking websites I love. This time I found this Lemon Rosemary Scone (The Pioneer Woman Cooks ), and have been thinking about it non-stop since. So this past weekend off, I decided to make them. Woke up early, ran down to my rosemary bush, picked a branch of fresh rosemary and was set…..
Sift together flour, sugar, baking powder, and salt. Mix cream with egg, lemon zest and rosemary and allow to sit for 10 to 15 minutes to steep. Use a pastry cutter or two knives to cut the butter pieces into the flour. Keep going until mixture resembles crumbs. Mix wet mixture with flour mixture; stir gently with a fork until combined. Mix should be crumbly, but if it’s too crumbly to work with, splash in a small amount of heavy cream. 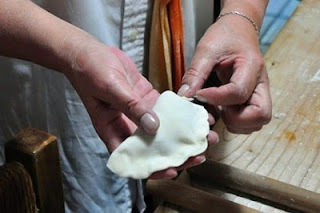 Turn dough onto a floured surface and lightly press it together until it forms a rough rectangle. Use a rolling pin to roll into a rectangle about 1/2 inch to 3/4 inch thick. 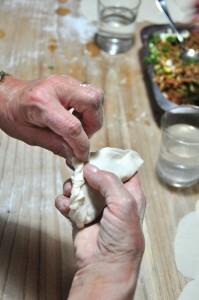 Use your hands to help with the forming if necessary. Final rectangle should be about 18 inches by about 10 inches. Use a knife to trim into a symmetrical rectangle, then cut the rectangle into 12 symmetrical squares/rectangles. Next, cut each square/rectangle in half diagonally, to form smaller triangles. Transfer to a parchment or baking mat-lined cookie sheet and bake for 18 minutes, removing from the oven just before they start to turn golden. Allow to cool for 15 minutes on the cookie sheet, then transfer to a cooling rack to cool completely. To make the icing, add lemon zest, lemon juice and rosemary into milk; allow to sit for awhile. Mix powdered sugar with the milk, adding more powdered sugar or milk if necessary to get the consistency the right thickness. Stir or whisk until completely smooth. One at a time, carefully dunk each cooled scone in the glaze, turning it over if necessary. Transfer to parchment paper or the cooling rack. Allow the glaze to set completely, about an hour. Scones will keep several days if glazed.